One of my all-time loves is the game of soccer, so naturally, when I became a high school mathematics teacher, I approached our soccer coach and said I wanted to coach. Up until this year, the boys played in the fall and the girls played in the spring, so I was able to coach both. I volunteered for two years with the boys before being hired as the JV coach when the previous coach stepped down, and started as the JV coach of the girls in my second year teaching. One year, the girls' squad had a game that was an hour and a half away, so we stopped at a restaurant for dinner on the way home. While waiting in line, one of the freshmen mentioned that she felt she was a genius. She was goofy and from time to time said some interesting things, and she did have a pretty good head on her shoulders. But we all liked to have fun, so I jokingly asked her how to spell "genius." "G-E-N-I-O-U-S!!! GENIUS!!!" she belted out as proudly as she could. Unfortunately, we had to inform her she was incorrect, and we all had a good laugh. She was slightly embarrassed, but she could take a joke (and really dole them out, too). But she followed this up by saying, "Whatever, you guys! Anyway, I'm going to be the next Einstein!" Now this is truly a statement that was meant to say that she wanted to do great things, and anyone that puts their minds to it can totally do so. But this statement left me thinking, and I replied, "Why be the next Einstein? Why not be the first Stevens?" She laughed, but I told her I was serious. Einstein had done his thing. Why follow in his footsteps when she could go off on her own path and forge new ideas for this world like we hadn't seen before. It's the kind of conversation that you love to have with students, but you're never sure if you get through to them or not. Fast forward a few months, and this student shows up in my classroom with a folded up piece of paper. She drops it on my desk and runs away. 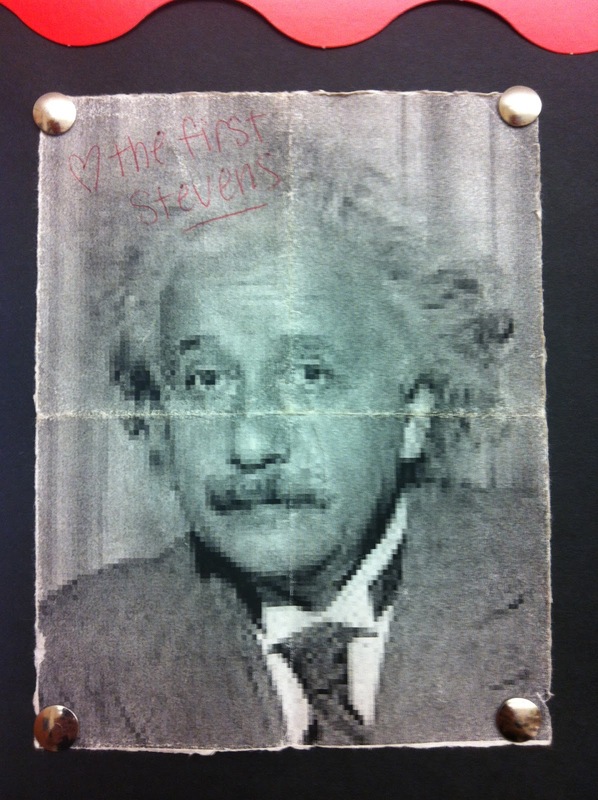 I'm unsure about opening the paper, but as I unfold it, I find a photo of Einstein with "The first Stevens" written on it. This is the type of thing that I hang up on the bulletin board by my teacher desk every year along with old photos and notes of thanks from students and parents. These are the pick-me-ups that I need day in and day out, especially with the way education is changing and the frustrations that come with the changes. It is years later, and I still have that printed out photo. Students ask me why I have photo of Einstein hanging on my board, and I tell them the story about not being the next Einstein, but the first YOU. It's one of those things that students will file in the backs of their brains, and probably won't think about for years, if at all. But I Stevens got it, if at least just for a short time. I wonder what great thing she is working on that will change this world. I truly hope she does become the first Stevens.